All heaters to be installed in vehicles also require an appropriate device for the acoustic damping properties and to reduce noise emissions. 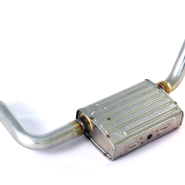 Our exhaust systems consist of a muffler with the corresponding pipe joints and fasteners for connection to the heater. The high quality materials that come to use, contribute to a long life of the entire exhaust system. All components of our exhaust systems with silencer and pipe joints are adapted to the installation situation of the different types of vehicles in connection with the heater in the car and guarantee optimal positioning. Thanks to our flexible manufacturing, we are in a position to offer a wide range of durable exhaust systems.